Due to Espresseur’s popularity with our new low price pointed machines, we thought a buyers guide would be a helpful way to understand what machine you might require from our range. The number of groups, boiler size and the electrical rating (generally the element power) determine the number of drinks produced per hour. An essential feature to consider in commercial machines is the number of groups. The two group is the most popular for most specialty coffee outlets. More groups should be considered in busy locations such as airport kiosks. Having four groups are a growing percentage of the market, and are found in high volume coffee chains, and very busy independent locations. We look forward to the day when four two group machines at a train station coffee bar in Venice, Italy become commonplace! A one-group machine is sufficient for smaller restaurants, where demand may be lower and seated customers, for example, can wait a few extra minutes for their drinks to arrive. Boiler size plays a role in the ability to deliver steam and hot water. Boiler size for one group machines can range from 1.8 to 5 litres, for two group machines from 5 to 12 litres, three group machines from 11 to 18 litres and 20 to 22 litres for most four group machines. Espresso production is the least affected by boiler size; using hot water (for tea and Americanos) is the most power consuming. Therefore, it is important to consider whether you are making a lot of doubles as opposed to singles, as well as the size of drinks. If your business is comprised of selling takeout drinks in 16 oz grande and 20 oz vente sizes, you’ll need much more performance from your machine, than in a restaurant situation where the drinks will be 6 and 8 oz single cappuccinos. The electrical draw of the machine (element rating) greatly affects the recovery power of the machine. Businesses that have a big morning or lunch rush, or that use the machines for Americanos, Crema Coffee and tea will need a higher capacity machine. As you might expect, the bigger the machine, generally the more power it draws and the quicker it can recover from a workout. However, machines can vary widely in their power and with different manufacturers. For example, smaller two group machines often have 2700-3900 Watt elements, and many manufacturers use elements around 4000 watts on their 2 group machines. Bezzera’s Ellisse full-size 2 group machines are all equipped with 4394 Watt elements giving them more power. Needless to say that with their larger boilers and industry leading power, Bezzera machines are among the most powerful in the world. Ensuring that the correct number of group heads, boiler size and power are the right size for the intended job is extremely important. However, no other factor affects the quality of espresso as much as the temperature of the water that is used to brew it. More poor-quality espresso’s are caused by brewing at the incorrect temperature, than by poor grinding and poor quality beans. A variation of as little as one degree from the optimum temperature of 95 C (203 F) measurably affects the quality and taste. We have seen machines that vary wildly – up to 12 degrees C (22 F) back and forth in the course of a few minutes. Whereas poor grinding and poor beans can be corrected, poor machine design cannot. Three factors affect the temperature of the water flowing through the espresso grounds. Only the first can be easily controlled by the service technician or a knowledgeable barista. 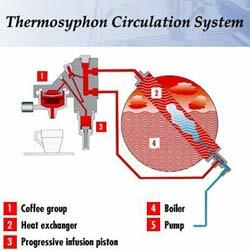 Boiler pressure and boiler temperature are directly related, so by adjusting the pressurestat (or possibly a thermocouple), the technician can adjust the boiler pressure/water temperature. Many Bezzera machines, including the popular BZ2009DE and the B2000DE machines use an advanced boiler management system which incorporates a highly accurate Dual boiler probe system provides superior safety & greater thermal stability. Normally, stable grouphead temperature is a desired feature. However, the ability to vary grouphead temperature during a brew (called temperature profiling) is gaining traction amongst roasters and specialty coffee shops. Just like searing a steak to lock in the juices, and then turning down the heat to finish cooking, coffee is a food and different brew temperatures can affect the finished taste. For instance, darker roasts can benefit from a lower brew temperature and lighter roasts can benefit from a higher brew temperature. The new EllisseDE PID has the ability to set each group to a unique temperature. In addition, each group has a adjustable pre-infusion and a exact digital boiler temperature setting. With this system, each coffee roast can be experimented with to achieve its perfect flavour profile! A lower powered one-group machines (Bezzera Giulia) will be able to deliver a good number of espressos (70) per hour, and steam enough milk for four restaurant sized cappuccinos at any one time. The Bezzera Giulia one group is also ideal for a lower volume restaurants or office location, and can provide excellent service where 10 – 20 drinks per day are averaged. This does not have to be spread out during the day, but can be accomplished during a brief morning rush for example. A full-sized one-group machine, plumbed -in and with a rotary pump such as the Bezzera BZ40 should be considered the minimum for smaller restaurant applications, where the number of drinks in a day may range up to 50 drinks per day. 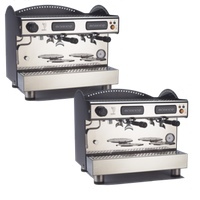 The two group machine is the size that will be considered by most operators, both for its power, the fact that it can brew up to four single drinks at once, and then flexibility and speed that comes with having up-to two steam wands even a steam wand is availble. A powerful two group machine such as the Bezzera Ellisse, B2000DE or B2009DE will satisfy all but the very busiest specialty coffee bars, and should be chosen when 75 to 500 drinks per day are made. The powerful two groups will easily handle much more volume than that, but sometimes two 2 group machines are a wiser choice – not just for power – but for the flexibility and working room that the extra group brings. Our price competitive 4 group option do have the advantage of more reserve power since there are 2 large boilers, bumping up to 22 liters from 11 for the 3 groups. A smaller machine that is operated at ‘near capacity’ will have more temperature variation than two machines operating on ‘cruise control’. Another advantage of 2 machines is that there is more room for a second barista to step in and help. On two & three group machines it is can become difficult for a secondary barista to help out, on two 2 group machines two people can work together provided that dual grinders are used. Another factor in this equation is that the Bezzera Ellisse auto-steam auto frothing system is like having a second barista helping since one barista can now froth two pitchers of milk at the same time – a huge time-saving economy. One last point about size – size can matter. It has been our experience as owners of specialty coffee bars and servicing countless others – that the size of machine can actually affect your sales and espresso drink program success. You are likely to be busier with a two group machine than a one group machine and so on simply because customers perceive your business to be more “professional” than the one down the street with the smaller machine. This is called ” counter presence” and it used to work for Starbucks, where four group machines were installed as a matter of course. Who was not impressed with the ‘power’ and the ‘presence’ that a four-foot wide machines have. Our 4 group options are basically a case of buying two, 2 groups. Putting them side by side or at each end of the counter. Our price reflects a genuine option with business advantages of a multi machine layout.